The Stockman is a farmbike built for the serious farmer who puts a premium on quality and technical superiority. 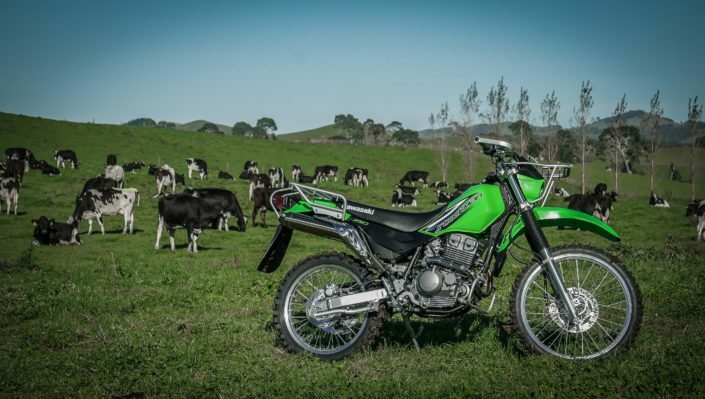 Designed especially for the Australasian farm market, the Stockman delivers 250cc four stroke torque and high quality construction. Features like dual kick stands, large carriers, and a low seat height are just some reasons why this is the world’s best farmbike. Powered by a brisk, reliable and economical air-cooled 4-stroke, 4-valve single cylinder engine, the Stockman enjoys a 50 cm3 displacement advantage over other ag bikes. Pumping out a smooth spread of responsive power right through the rev range, the Stockman has plenty of on-call, get-up-and-go throttle response to get ahead of the herd or power up steep hills. Mated to this responsive engine is a smooth 6-speed transmission with gear ratios set for optimum all-round agricultural performance. To complement its hardy-go-anywhere performance, the Stockman sports comfort and convenience features such as an electric starter and a supple, comfortably configured suspension, and is designed with ease of maintenance for the self-sufficient farmer in mind. Further broadening the Stockman’s usability are low effort controls, a conveniently low seat height, side stands on both stands, an engine guard and sturdy front and rear carriers. Attention to detailed weight reduction and weight distribution give the Stockman superb lightweight maneuverability and easy handling qualities, enabling this ag bike to handle all-day hard yakka without feeling beaten up. The engine is protected by the front engine guard. Rust-resistant fasteners contribute to engine quality. Built tough, and integral to the Stockman’s chassis design, the front carry rack features a spring retaining clip for securing light loads while the sturdy rear rack will carry up to a hefty 20kg.